This article, co-authored by Jeffrey Chappell and Charles Timbrell, appeared in the November/December 2000 issue of Piano & Keyboard Magazine. The following excerpt is by Jeffrey Chappell. ARTUR SCHNABEL (1882-1951), a student of Leschetizky, came to live in New York City in 1939 after developing a strong following in Europe as a performer and teacher. He exemplified a new 20th-century esthetic, which was the quest to honor the composer’s intentions rather than the performer’s showmanship. This was coupled with an exhaustive investigation into original texts and, in his case, a choice of repertoire that lent itself to exalted introspection over extroverted display — Mozart, Schubert, Beethoven, and Brahms. Those who heard Schnabel sensed a vast inner world behind his playing. It was this aspect of music-making that dominated his teaching. Minutely subdivided phrases grouped against the obvious strong beats or patterns; ideals of sonority inspired by orchestral instruments; penetrating examination of structural underpinnings; and lucid images (measure 57, last movement of Beethoven’s opus 109, was “like a deathly stare”) were a few of the points touched on in his encyclopedic discourses. Schnabel led students to see a composition from its creator’s viewpoint, which may in part be due to the fact that he was a composer. Schnabel’s students included Maria Curcio, Clifford Curzon, Rudolf Firkusny, Claude Frank, Leonard Shure, Beveridge Webster, and Konrad Wolff, the latter of whom wrote an indispensable book, “Schnabel’s Interpretation of Piano Music”. Possibly the most eminent among them is LEON FLEISHER (born 1928), whose profound insights and forceful personality make him one of the most sought-after teachers in the world. Although an artist and thinker in his own right, he credits Schnabel for the basis of his work. 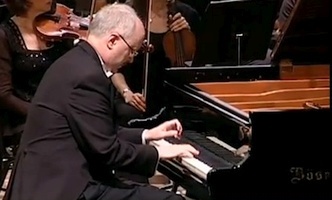 However, says Fleisher, “Passion, not technique, is what I learned from Schnabel.” For both teachers, the musical concept comes first and then the appropriate physical gestures follow, outlining the form and flow of the music. The technique is automatically produced by the music that drives it. One of these concepts is to defy gravity. The last note of a piece comes to rest, but what precedes it is movement aloft, delaying that final surrender. Technically, this translates into floating arms that trace the shape of each phrase, as if choreographing the music. The fingers are an extension of the arm, and the keyboard is an extension of the fingers. The pressure of the arm is analogous to the breath of a singer while the fingers are analogous to the enunciating teeth, tongue, and lips. The fingers may slide forward on the keys, touching them like silk, or may anchor in one spot as the arm thrusts forward. “One speaks upward and forward,” said Schnabel, “and therefore one must not play downward and backward.” Meanwhile, the body remains stationary; weaving around displaces energy that should be going into the instrument and into the music. As the musician freely responds to sound and silence unfolding in time, the physical mechanism remains freely open to all possible options of movement. This approach is counter-intuitive to the fact that piano keys go down, and that nothing more can be done afterwards to influence the sound, such as making a crescendo. Schnabel and Fleisher would have the pianist maintain involvement with the sound before and after it begins, for example by moving the arm on a held note, or by inwardly experiencing the music as if it were making a crescendo. Then the limitations of the piano don’t limit the music being played on it. The imagination of the musician transcends the instrument, and the audience hears something more than the actual acoustical events.